Raaga.com: Is Amitabh Bachchan starrer WAZIR writer Abhijat Joshi the new Salim-Javed of contemporary cinema? Is Amitabh Bachchan starrer WAZIR writer Abhijat Joshi the new Salim-Javed of contemporary cinema? 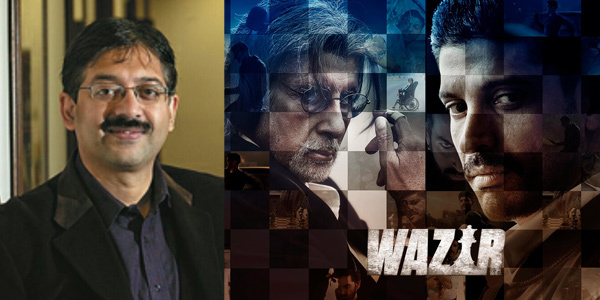 Eminent script writer Abhijat Joshi, who has to his credit blockbuster scripts like MUNNA BHAI MBBS (2003), LAGE RAHO MUNNA BHAI (2006), 3 IDIOTS (2009) and PK (2014) is reported to have been paid a whopping Rs 2 crore for his upcoming film WAZIR staring Amitabh Bachchan and Farhan Akhtar in key role. Truly with Rs 2 Crore for a single script Abhijat Joshi has placed himself in the position of Bollywood’s top most writers’ duo Salim Javed, who ruled the 70’s and are recognized as the first writer pair to bring revolution in the remuneration scale of writers. Salim Javed, who wrote super-hit films like ZANJEER, SHOLAY, DEEWAAR, DON, MR.INDIA etc not only changed the remuneration package for themselves but also opened doors for other competent writers like Kader Khan, K.K. Shukla, Inder Raj Anand etc. However after the 90’s once again the status of film writers went down. “When we wrote ZANJEER we demanded Rs 1 Lakh and were paid! We changed the remuneration pattern due to our confidence and guts which I think writers lack,” he asserts. Besides Salim Javed the other writer in contemporary cinema who has gained stardom as a writer is Chetan Bhagat, thanks to the success he got for the credits for 3 IDIOTS and other hit films like KAI PO CHE!, 2 STATES, KICK. Thus it is high time writers come out in open and demand for their rights for better remuneration, if they want to earn stardom like Abhijat Joshi and Chetan Bhagat!